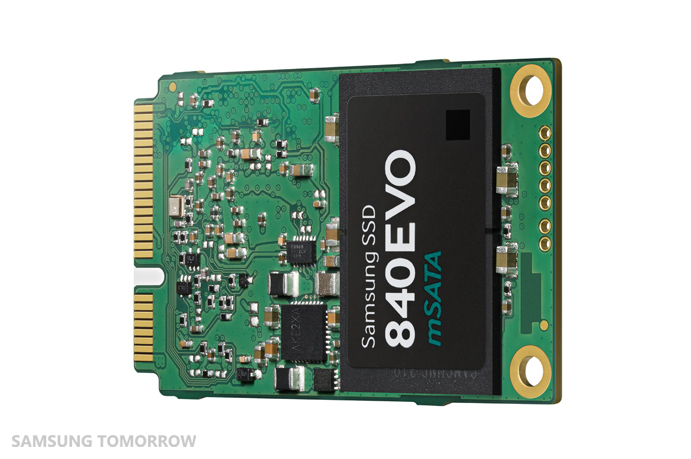 High density and performance are some of the features consumers look for in solid state drives, the Samsung 840 EVO mSATA SSD has all these qualities in addition to being compact. As an extension to the 840 EVO line-up, the mSATA SSD utilizes 128 Gb NAND flash memory based on 10nm chip technology offering upto 1TB in storage. Other drives in the lineup offer capacities of 120GB, 250GB, and 500GB. Performance on the drive is boosted by Samsung’s proprietary controller and TurboWrite technology. For complex multitasking, the 840 EVO mSATA SSD supports random read speeds of 98,000 IOPS and random write speeds of 90,000 IOPS. The drive can be used with other storage devices embedded in the notebook including hard drives and solid state drives. For data protection, the 840 EVO mSATA SSD applies 256-bit AES keys.